The interruption of breathing during sleep is known as Sleep apnea. Sleep apnea is considered as a highly common sleep disorder which affects approximately 20 million people in America. Sleep apnea means when a person suddenly stops breathing periodically while he is sleeping. This type of cessation in breathing can occur with anyone from several times a night to hundreds times per night. As the result, the brain and other organs of the body might not get enough oxygen for operating normally. When you stop breathing in your sleep, you might be awakened from sleep because your brain might be forced to wake up from deep stage of sleep, then send the signal to the body to breath again. Typically, normal breathing then starts again, sometimes with a loud snort or choking sound. When this occurs to you a few times an hour, the quality of your sleep might be affected, and other medical problems might arise after that. SleepApnea is one of the leading causes of excessive daytime sleepiness. The main reason is that your airway gets blocked by throat muscles that are too relaxed or by large tonsils, tongue and soft palate or even the fat in your neck. Now you got the main idea about the definition of sleepapnea. Let’s define some common types of sleep apnea disorder. I think a lot of people might be aware of the most prevalent form of sleep apnea. Obstructive sleep apnea, but there are still other types of sleep disorders that could occur in human body. So now let’s discuss more detailed about all the types of sleepapnea, the causes and risk factors of these types. It is the most common type of sleep disorder. Obstructive sleep apnea affects nearly 4% of men and 2% of women. Obstructive sleep apnea occurs when the airway has collapsed or is blocked during sleep, usually when the soft tissue in the back of the throat collapses during sleep. This blockage of the airway might cause shallow breathing or breathing pauses. Then when you try to breathe, any air squeezing past the blockage might lead to loud snoring. This type of sleep apnea happens more often in people who are overweight, but it can affect anyone. Or for more detailed, Obstructive sleep apnea is explained like while you are sleeping, your throat muscles relax letting your tongue or fatty tissues of your throat fall backwards into the airways and result in the blockage of airflow. So your brain might not be supplied enough blood flows. This awakes your brain from sleep and send the signal to your body that you need to breathe. This sleep disorder often comes with a loud gasping, choking, or snorting sounds when you take a deep enough breathe to fight past the obstruction. And then after taking a breath, you would return to sleep again, but the process might be continued to happen once again. This can occur several times per night or up to hundreds of times. Mild OSA – The sufferer experiences 5-14 episodes of interruptions in breathing in an hour. Moderate OSA – The sufferer experiences 15-30 episodes of interruptions in breathing in an hour. Severe OSA – The sufferer experiences 30 or more interruptions in breathing in an hour. Stopping breathing or irregular breathing during sleep. Abrupt awakenings accompanied by shortness of breath. Depression or irritability: Lack of regular quality sleep can wreak havoc on a person’s mental well-being. Sufferers of obstructive sleep apnea often find themselves feeling short-tempered, and in time it can lead to more severe symptoms of depression. 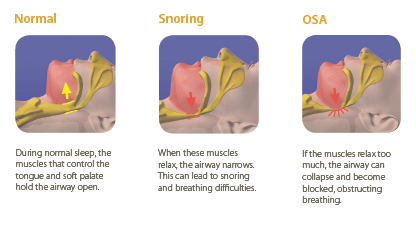 Snoring: not as prevalent as it is in OSA patients. Frequent cessations in breathing during sleep. Restless sleep: Sufferers of obstructive sleep apnea often have fitful sleep as their mind and body are constantly awakened throughout the night, pulling them out of the much needed stages of non-REM and REM sleep. Excessive daytime sleepiness: Caused by frequent interruptions of sleep. Morning headaches: Stem from the loss of oxygen in your bloodstream that flows to your brain as a result of the irregular breathing at night. Snoring loudly, disruptively, and regularly. Weight gain: If you have a high body weight (overweight or obese), properly you might have more risks of suffering from Obstructive sleep apnea than those maintaining a healthy weight. Large neck size: You are more likely to suffer from this sleep disorder if you have a neck size of 17 inches or higher for men, and 16 inches or higher for women. Sleep apnea might be caused by excess fatty tissues built up in your neck and throat. So having a large neck means you would have more soft tissue that can cause the blockage of the airway and stop your breathing process during sleep. Aging: The risk of having Obstructive sleep apnea for an adult become higher and higher with age, it is approximately 40 percent in women and men over 60 years of age. When people get older, their muscles begin to lose muscle tone. This of course also happens with the muscles in human throat. As throat muscles lose definition, they become weaker and more likely to collapse into the airways during sleep. Enlargement of tonsils or adenoids: Enlargement of tonsils or adenoids are the causes of Obstructive sleep disorder in children but can also affect adults who did not yet have a tonsillectomy when they were younger. Natural causes: Some people tend to have a narrower throat naturally or may have an enlarged tongue falling backwards into the airway. Frequent alcohol use: Alcohol could relax the muscles in human body including the throat muscles. This muscle might be relaxed leading to the blockage of the airway during sleep then you might stop breathing while sleeping. Smoking: Smoke is an irritant to the lungs, throat, and esophagus. It might result in the inflammation and fluid retention of the upper airways that can impede airflow. Male gender: Obstructive sleep apnea is two to three times more likely in men than women. In addition, the higher amount of estrogen and progesterone a woman has, the lower risk of suffering form Obstructive sleep apnea she might have. Because these hormones offer the protection against this apnea disorder. Body structure: Some facial structure features, such as a small lower jaw (mandible), gives a high risk of Obstructive sleep apnea disease. Moreover, people having small airways in their noses, throats, or mouths also are more likely to have this sleep disease. Smaller airways may be explained based on the shape of such these structures or allergies or other medical conditions that cause the congestion in these areas in human body. Hypertension: High blood pressure is extremely common in people who have sleep apnea disorder. Hormones: Women are much more likely to develop sleep apnea after menopause. Because as I mentioned before, the hormones estrogen and progesterone could help to protect the body against Obstructive sleep apnea. Hereditary: Sleep apnea is a heritable condition. If you have someone in your family that is suffering from this disease, so you would have a high risk of this pathological condition. Inherited traits that increase the risk for this sleep apnea disorder include obesity and physical features such as a recessed jaw. Other common family factors, such as physical activity or eating habits, also may play a role causing Obstructive sleep apnea. Central sleep apnea is a less common type of sleep disorder. It is believed that nearly 20% of sleep apnea cases are CSA, but there are those who claim that the amount of Central sleep apnea patients might be much lower. Unlike Obstructive sleep apnea, which could be considered as a mechanical disorder, Central sleep apnea is more of a communication problem. This type of sleep apnea is often caused by medical problems and conditions affecting the brainstem. The airway is not blocked with Central sleep disorder. This pathological condition happens when the area of your brain that controls your breathing process fails to send the correct signals to your breathing muscles due to instability in the respiratory control center. You properly make no effort to breathe during several brief periods. It is claimed that Central sleep apnea often comes along with Obstructive sleep apnea, but of course it can also occur alone. Snoring does not happen with this kind of apnea disorder. These different causes often lead to varying symptoms and different types of Central sleep apnea disease. Weight gain: Having a high weight is also considered as a main cause leading to this Central sleep apnea pathological condition. Cheyne-Stokes respiration: Individuals that are suffering from congestive heart failure have a high risk of having this kind of respiration – a pattern of irregular breathing. The accurate cause of Central sleep apnea is not yet discovered. Although it is believed to be related to changes in the control effort of breathing due to the increased amount of time it takes blood to circulate through the body in patients with congestive heart failure. High altitude: Another type of Central sleep apnea disorder is caused by a type of periodic breathing process, which mainly occurs as patients come to a high altitude. But in some individuals, this periodic breathing might happen even at normal elevations if they are predisposed to the condition. Acid reflux, postnasal drainage, and the consumption of alcohol: But for many patients there is no direct cause defined specifically to lead to their apnea disorder. Gender: Men are more likely to be suffered from Central sleep disorder than women. Age: Older adults have higher risk of this pathological apnea condition than younger people, especially those whose age is over 65. Having congestive heart failure: It is claimed that people with heart disorders such as atrial fibrilation and congestive heart failure are more likely to have the disease. Brain tumor or opioid medication: People who have had a stroke or have a brain tumor or who are using opioid medications are at a great risk having this Central sleep apnea disorder. Positive airway pressure devices: Some individuals who are suffering from Obstructive sleep apnea might develop the Central type when they are being treated with Positive Airway Pressure (PAP) devices. What does Mixed Sleep Apnea, or Complex Sleep Apnea, mean? Mixed sleep apnea or Complex sleep apnea, is a combination of both types of sleep disorder – Obstructive and Central sleep apnea pathological condition. Sometimes, patients of Obstructive sleep apnea disease are treated with the application of CPAP machines. Then some of them develop the symptoms of Central sleep apnea upon PAP therapy. This kind of special phenomenon had been noticed in sleep labs for a long time, but no scientists had not completed the research for it yet. When the patients are diagnosed to have Obstructive sleep apnea, apnea doctors would apply the CPAP treatment to treat them. If it goes well, the patients’ airways would be successfully splinted open and free from obstructions, but those patients continued to have difficulty breathing while asleep. Their symptoms of Obstructive sleep apnea shifted to symptoms of Central sleep disorder while CPAP therapy was being applied. Heart attack: Patients could make irregular heartbeats more likely or even heart attack. Diabetes: People with this condition tend to have the OSA disorder. Average life span: It is believed that the estimated average life span of an untreated patient with sleep apnea condition is 20 years shorter than human average life span.